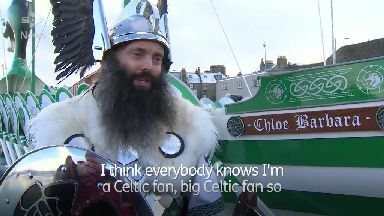 Thousands of people will descend on Shetland to celebrate the islands' viking past. Thousands of people are due to gather for the world-famous Up Helly Aa fire festival on Shetland to celebrate the vikings who once ruled the islands. 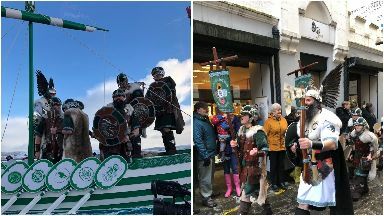 People dressed as Vikings march through the streets of the town to recreate its ancient Viking past, in a tradition dating back to the 19th century. 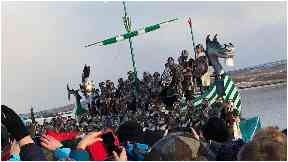 A torchlight evening parade will then culminate with the dramatic burning of a replica Viking long ship. Up Helly Aa is a descendent of the ancient festival of Yule which the Vikings held to celebrate the rebirth of the sun after a long winter. The Jarl squad of warriors will parade through the town before assembling for a civic reception in the morning. The afternoon schedule features visits to several schools, hospital and homes, as well as Shetland Museum. Squads will then start to gather on the Hillhead in the evening before more than 1000 torchbearers march to the King George V playing field. A firework will then be set off to give the signal to light up the galley. The spectacular finale will be followed by feasting, drinking and dancing all through the night.